Balinese people, from the island of Bali, Indonesia, are an amalgamation of Chinese, Indian, Arabs, and other groups coming directly to Bali or by way of Java. After several centuries, they adhere to their own distinct language and cultural forms. Their language has a system of politeness levels. When addressing one another, they address the Hindu Brahman priests one way, address people of high social status, older people, or one's parents another way, while talk to those they consider of equal or inferior status in another way. Their practiced form of Hinduism is quite distinct from other practiced forms of Hinduism in India. It is filled with more rituals and dramatic features, causing it to permeate the daily life of a Balinese person. As a result, they have interwoven their secular and religious life in such a way that one can say every little action of a Balinese has some religious connotation. Their ritualistic practices are displayed in stone and wood carvings, cremation ceremony, trance dances, and vibrant music - all intended to please the gods and the goddesses. The temple is the center of their ritualistic practices. Pray God to send evangelical Christians who will seek out and discover where the Balinese people in the United States reside. Pray God will work through dreams and visions to reveal the truth found in the one and only Messiah Jesus Christ for the world. 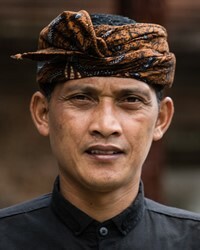 Pray that evangelical Christians will intentionally become friends with Balinese people and minister to their physical and spiritual needs.